Thieves Essential Oil Natural Cough Drops natural cough suppressant and oral anesthetic are the perfect sore throat and cough remedy made with essential oils! They offer unique comfort for relieving coughs, soothing sore throats and cooling nasal passages. These wonderful soothing lozenges are made with the therapeutic grade essential oil of the very popular Thieves blend which supports a healthy immune system. The Thieves Essential Oil was developed based on the ingredients found in the “Four Thieves Vinegar” or “Marseilles Vinegar”. The vinegar was first prepared by thieves that worked in the spice industry to ward off what plagued them. Whether you need sore throat home remedies, cool and clear nasal passages or looking to soothe laryngitis, these are for you. The cool and sweet yet spicy flavored drops are made without dyes, sugar, artificial flavors, and preservatives; and are very long lasting. 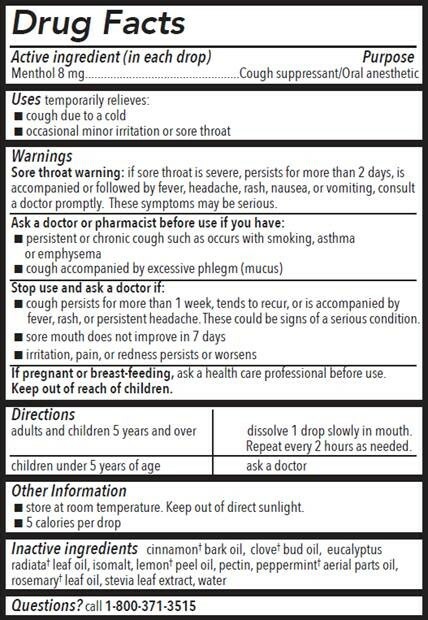 This is an easy reference guide for Thieves Essential Oil Natural Cough Drops. It will tell you how to use them and what to use it for. It will also provide you with some fun tips and testimonials! Want to Purchase Thieves Essential Oil Natural Cough Drops? Then go to The Oil Shop! 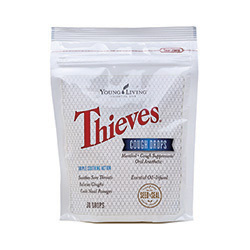 Buy Thieves Cough Drops Here! What is in Thieves Essential Oil Natural Cough Drops? There are several natural ingredients as well as six essential oils in Thieves Essential Oil Cough Drops. Clove Essential Oil (Syzygium aromaticum) promotes a healthy immune response, and may support overall wellness*. An important ingredient in Young Living's Thieves blend, its principal constituent is eugenol. Lemon Essential Oil (Citrus limon) Lemon consists of 68 percent d-limonene, a powerful antioxidant; and may be beneficial for the skin*. It has cleansing and purifying properties. Jean Valnet MD estimated that it takes 3,000 lemons to produce one kilo of oil! Cinnamon Bark Essential Oil (Cinnamomum verum) The essential oil promotes a healthy immune response, and helps maintain a healthy lifestyle regimen*. Eucalyptus Essential Oil (Eucalyptus radiata) may support a healthy respiratory system; and to soothe muscle discomfort after exercise*. Peppermint Essential Oils (Mentha piperita) most highly regarded herbs for supporting normal digestion, including promoting healthy intestinal function and gastrointestinal system comfort*. Promotes focus and emotional wellbeing. What are the Documented Uses for Thieves Essential Oil Natural Cough Drops? Bad breathe, freshening breath, relieve sore throats, cough suppressant, oral anesthetic; post nasal drip cough; post nasal drip throat clearing and sore throat, runny eyes, cough; home remedy sore throat and cough. Adults and Children 5 Years and OVER: Dissolve 1 drop slowly in your mouth. Repeat every 2 hours as needed. Children UNDER 5 years of Age: Please consult your health care provider or doctor. Can this oil be used for Animals? Yes but would be difficult. However, if one fell on the floor and they ate it, I would not be concerned since we use Thieves Oil for our animals. What are the Safety Precautions? FDA Approved. Over the Counter (OTC) product. Keep out of reach of children. Follow directions above for children. If sore throat is severe, persists for more than 2 days, is accompanied or followed by fever, headache, rash, nausea, or vomiting, consult a doctor promptly. These symptoms may be serious. Sore throat does not improve in 7 days. There is a whole line of Thieves products that are awesome! I use them all -Thieves Essential Oil, Thieves Spray and Thieves toothpaste are all great! And now, NEW Thieves Laundry Soap and Thieves Fruit and Vegetable Rinse and Wash!